Meet Patricia…Are you my forever family? Patricia is an outgoing, charismatic and fun-loving youth. She has a wonderful personality in which she loves conversing with individuals of all ages. Patricia has a sweet character and loves sharing in laughter and fun with all those that surround her and very much enjoys participating in outdoor activities such as swimming, riding bikes and playing soccer. Patricia is very creative, and likes to soak in new information by reading books, she is also currently taking piano lessons, as her interests in music is growing; and she chooses to spend her extra time listening to a wide variety of music, with Country, Christian and Hip Hop music topping the list. Patricia expressed that she has a strong Christian faith, which helps her to move forward and stay on track with her goals in life. She actively prays and feels it is important to attend church and is involved in youth group activities, to continue to grow in faith. 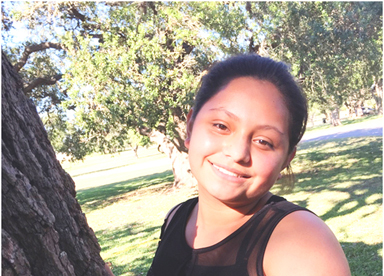 Patricia is currently in the 8th grade, where Science, Social Studies and Reading are her favorite subjects, and takes pride in her school work. Patricia can appear to be shy when meeting new people, however is able to quickly build rapport and be her wonderful and joyful self with those she loves and trusts. Patricia works well with her caregivers, teachers and counselors on creating and achieving goals that are important to her. Patricia would love a family who enjoys outdoor activities and would support her with her academic goals, interests and in her Christian faith. Patricia is ready to find a forever family to share in her life. If you think you could be Patricia’s forever family please contactjessica.maniglia@dfps.state.tx.us.